Quintin Stephens had a very strong performance in his 100 meter wheelchair race on Saturday, June 30, at the USA Paralympics Track and Field Meet in Indianapolis. Quintin was awarded a bronze medal. His time met the qualifying standard set by the International Paralympic Committee, but unfortunately did not meet the USA Paralympic Committee qualifying time for the USA London 2012 Paralympic team. So while he will not be part of the USA London 2012 Paralympic team, Quintin has already set his sights on the World Paralympic Track and Field Championships in Lyons, France next year. He has a very good chance of making the USA squad. 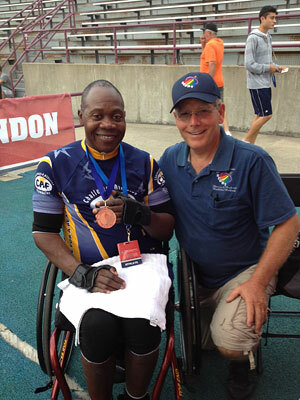 At age 54 Quintin was easily the oldest track athlete at the Indianapolis meet. His quadriplegic performance inspired many. Quintin broke his neck in an accident in 1981 and has been wheelchair racing since 1983 to maintain his health and independence. In the short video below, Quintin shares from the track where he competed.